Here is our first report from a Euro-Varminter, Fabian Müller, who hails from Germany’s Black Forest region. He’s put together a sweet little Sako 75 that’s taken game in all seasons, by daylight and moonlight. 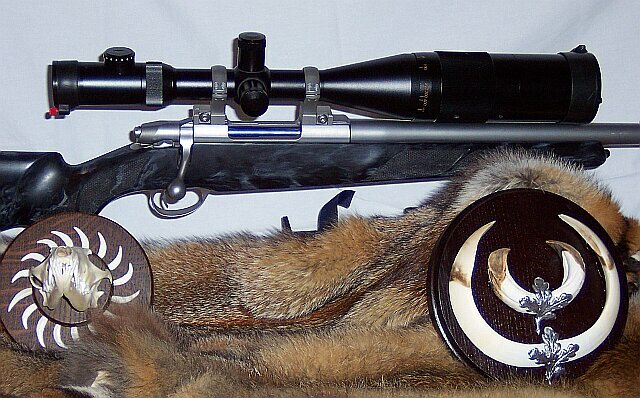 Fabian writes: “This is my dream 6BR hunting rifle, based on a Sako 75 short action. It features a 6PPC magazine holding 4 rounds up to 2.36″ long. With the short magazine, the rifle feeds smoothly and reliably–no problems at all. The rifle has a 24″, 1:12 Shilen barrel, #5.5 contour. The stock is a Sako-style McMillan, pillar-bedded. The trigger (factory Sako) is pretty heavy at 1000 grams (2.2 pounds). This is perfect for hunting, but not ideal for precision shooting; one needs lots of practice to get tight groups with a 2.2lb trigger. Still, the rifle easily produces 0.25” groups if I do my job right. But winning a benchrest match is not the gun’s purpose. Many factors make it difficult to shoot one-holers with this gun–the buttstock angle, the narrow fore-arm, the thin barrel (which heats up quickly), and the heavy trigger. But I’m still delighted with the gun’s accuracy, as you can see from the targets. My favorite loads are 75gr V-max with N135 at 3410 fps and 87gr V-max with N140 at 3100 fps. At that speed, despite what the “experts” say, the 87gr V-max stabilizes just fine in my 1:12 barrel. The heavier bullets need to be seated into the lands with N140, while the lighter bullets like to just touch the lands. I find the 6BR an ideal round for my distances up to 400 yards. I don’t need more power. I prefer this gun even over my 22-250 because the 6mm BR Norma bucks the wind better, particularly with the 87gr V-Max (.400 BC). I hunt in Germany, where hunting and shooting is different than in America. Our varmints are crows, red foxes (normally at night) and pigeons in some areas. Sometimes I stalk the little roe deer with the 6BR at long distances. As for larger game, the boar’s teeth show what the 6BR can do with the right bullet. I took him in a hunting area, where, so the land-owner claimed, there were no wild pigs to be found. So, I take my 6BR for shooting roe deer and there he comes–a big wild boar. I hesitated for just a second, but then as soon as he stood still and I could see his neck I released the shot at about 130 yards. He fell like a stone to earth. The 87 V-max disintegrated completely, destroying the boar’s neck bones in the process. We don’t shoot groundhogs or prairie dogs in Germany–we don’t have those species here. And when we hunt, one-shot-one-kill is the rule, because the animals flee. After shooting a crow, you often have to wait a full hour for the next victim to come along. A German varmint hunter learns to be patient. It is not unusual to wait 8-16 hours for a fox to appear. We hunt foxes normally out of wooden boxes, called “Hochsitz”. You can hunker down for hours, protected from wind and rain, and the foxes can’t see or smell you. They are very wary! Normally we put out some dog-food as bait to bring the foxes in range. Or you call them, or do a combination of both. In summer, you can see the young ones at daylight, and then long shots are needed. I have made ballistic cards for quick zeroing out to 600 yards. In my Hochsitz, I have good rests for the rifle, so long-range shots are quite easy (compared to the wobbly rests when I walk around). The photo shows typical areas where you can hunt crows. If you wonder about the streets and houses, that’s normal here. Germany is much more settled than US, so we don’t have areas without people. We have to pay much more attention to ricochets, and that makes bullet selection very important. I normally use moly-coated bullets only. With the 75 gr V-max I use 31.5gr of N135 for accuracy or 32.5gr (3410 fps) for long-range hunting. Bullets are seating to just touch the lands. With the 87gr V-max, 32.5gr of N140, jammed 0.011″ into the lands, gives me 3100 fps with top accuracy. I also use also 70gr Sierras or 69gr Bergers with 31.5 grains of N135, just kissing the lands. I didn’t measure velocity. With N135 I can jam the bullet 0.01″ into the lands without loosing accuracy, but I don’t feel like doing it. With N140 I always go into the lands for better accuracy and lower SD. The light bullets also work well with faster powders like N133 or N130. For primers, I use CCI BR4s and sometimes the CCI 400s with reduced loads. Martin Menke, the gunsmith who built the gun and trued the action, told me that because of the length of the 87 V-max the bullet wouldn’t stabilize. I tried it against its recommendations. To my surprise, it proved to be one of my most accurate bullets, and it is stabilized to at least 400 yards. I found the same to be true for the 85gr Sierra varmint bullet, which is also a very accurate bullet with the same loads I use for the 87gr V-max. Mister Menke said that at longer distances the V-max might tumble, but I haven’t observed that yet. In Germany you are allowed to hunt at night for wild pigs and for furred varmints, mostly foxes and marten. You are not allowed to use spotlights or night-vision optics. That means we usually hunt when the moon is full. On my Sako, I use a Nightforce 8-32×56 with the illuminated NP2DD reticle. Even with its lighted reticle, the Nightforce needs a fair amount of moonlight, because of its narrow field of view. Try to center a running fox in your scope at night and you’ll learn its very difficult. With snow, the Nightforce is superb, because you can see the foxes over 600 yards away. A Nightforce offers the minimum lowlight capability you need to hunt at night. It offers excellent transmission and contrast. While I love my Nightforce for both day and night use, both Zeiss and Swarovski make lower-power scopes that are better-suited for dedicated night use. The best night-hunting scope I’ve found is probably the Zeiss Varipoint. But even with the Varipoint, shooting at night is difficult, because you cannot look directly at your prey. Instead you must look a few inches to the side, because of the blind spot right in the middle of your retina. Try this some evening–you may be surprised! One of the nice features of the Sako 75 action, as well as most Tikkas, is that dovetails are machined into the top of the receiver. This provides a nice, low-profile mounting point without use of a separate rail. It also gives better alignment than a rail, which is attached by screws that might not be tapped perfectly centered. 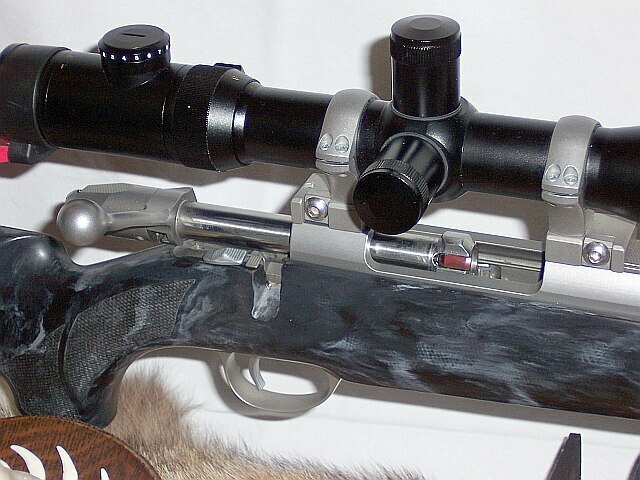 My scope is mounted with Sako Optilock rings with integral bases. These are nice units. Like Burris Signature rings, Optilocks employ inserts which self-align to the rings and hold tight without heavy screw-torque. Using the inserts, your scope never gets scratched during mounting and you don’t have to lap the rings to get a perfect fit. They seat securely without heavy screw tension. I had doubts about the Optilocks when I first tried them but now I think they are the best. Your readers may be interested in the recoil lug. As you can see in the top-most photo, there is no conventional recoil lug sandwiched between the action and the barrel shoulder. The photos show the pillar bedding in detail. 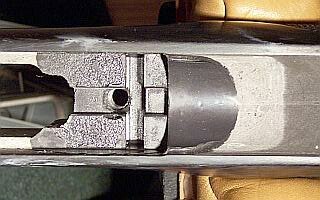 The Sako 75 has a built-in recoil lug, which is screwed in to the bottom of the action. It fits into a recess in the stock, similar to many Mausers. The lug itself is similar to Remington’s 700 VSSF recoil lug, only a bit thicker. The Sako action is flat, so bedding is easy. Having been a 6mm BR Norma fan for long, I have to say I love this website. But I think I may be the only German actually using this caliber for game-hunting (it’s quite common for match shooting however). With bullet weights up to 85gr, my Sako 6BR can beat the .243 Winchesters, providing better accuracy while burning much less powder. But I will admit, for the heavier bullets, the .243 packs more punch, which can be essential when hunting larger game.